Wine has been pretty interesting to many people throughout the ages and should be one of the main ingredients in a successful self catering holiday, but where do you start in a country which exports very little of this wonderful nectar so the wineries and grape varieties are little know to foreigners traveling in Greece. I was once stopped by a gentleman in Kefalonia who asked my advice regarding choosing a nice bottle of Greek wine to accompany the food his wife had prepared, he said that I looked like I knew what I was buying, though I am not quite sure what he meant by that! Normally, he would have known which variety and year were the ones to go for but in this little winery just outside Fiskardo, the man was lost. It is not so surprising since there are over 300 indigenous grape varieties in Greece although only 24 of them are of any great significance, producing wines for an international market. The remaining varieties end up being served in the little metal jugs that we find in the majority of tavernas throughout Greece that we foreigners collectively refer to as Retsina. This is a mistake of ours since Retsina is a wine that has been treated with pine tree resin which gives it a sappy and turpentine like flavour but the truth is that it all tastes pretty much the same. The main point of this editorial is to focus more on the international quality wines than the ones that are served in metal jugs and Greece has its fair share of really excellent wine. 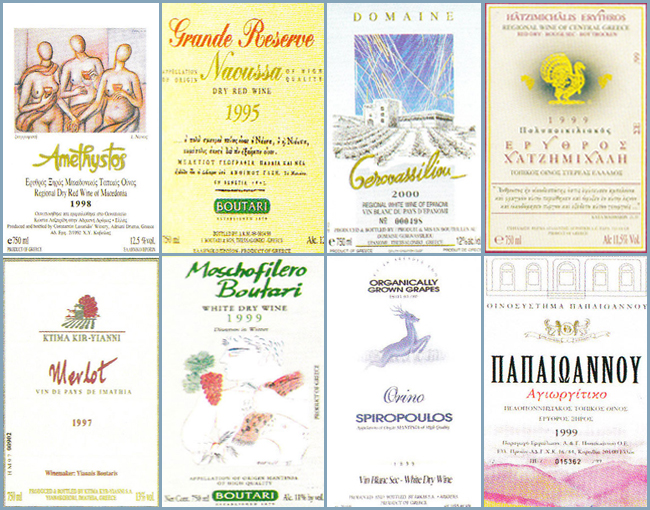 Moscofilero, Assyrtiko, Vilana, Xynisteri, Robola and Rhoditis grape varieties produce the majority of the good white wines of Greece while Xinomavro, Agiorgitiko, Mandelaria, Limnio, Mavro and Ophthalmo are the names of the red grape varieties. Wine makers often blend these juices with more familiar grape varieties such as Cabernet Sauvignon, Cabernet Franc, Grenache, Merlot, Syrah and Chardonnay which are also all grown in Greece. So where does the average holiday maker start? There are several labels that are well worth looking out for. Here are some of them below. The Peloponnese grows about a quarter of the grapes used in the production of Greek wine and is predominantly red wine country. Nemea uses the Agioritiko grape to produce a spicy, well structured red while the highly prized Mavro Daphne of Patras offers a dark, oily fortified wine. The Mantinea region produces a fruity white wine using the Moscofilero grape, which is a particular favourite of mine. The best wine makers can be found in Macedonia, the most famous being the Boutari winemakers who sells its wine both nationally and abroad under the label John Boutari & Sons. Yannis Boutari himself makes high quality red wine in deliberately small quantities and markets them under the label Kir Yianni. Constantin Lazaridi created a very modern estate in 1992 which aims to produce wine of international class. Laziridi winery is located in the Drama region. Markovitis estate focuses on organic methods and the Gerovassiliou winery develop French wine culture and aims to produce the same very high quality wine. Many of the islands offer really good wines, the most famous being Kefalonia, Santorini, Paros, Samos and Crete. It is believed that the first Mediterranean vineyards were found on Crete and the practice of wine making was taken by the Minoans to the islands of Santorini and Paros. Due to the strong winds that blow up in the Aegean, the grapes are not grown high on trelaces but low, on the ground, in basket like shapes. The volcanic rocks of Santorini collect moisture from the sea at night and release it gradually throughout the day to the vines. This unique micro climate is responsible for the production of the best white wines of the Assyrtiko grape variety. One of the grapes most frequently grown in the Attika region is the white wine grape Savatiano and it is from this grape that some of the best white wines in Greece are produced. The grape produces distinctly robust and full of character wines that are relatively low in alcoholic content. Hatzimichalis, Fragou, Vassiliou, Strofilia, Semeli and Megapanos are the names of the more renowned estates in the Attika region.